Anne Brontë and her sisters will forever be associated with Yorkshire, and indeed she only ever made one journey outside of her home county, but what a journey it was! I’m lucky enough to be spending some time in England’s capital myself, so in a series of three blogs I’ll be following Anne’s footsteps and reliving the adventures of Anne Brontë in London. In the next blog I’ll be looking at the reason for Anne and Charlotte’s sudden journey, the publishing house of Smith, Elder & Co. In the third blog I’ll examine the enjoyment that Anne gained from her visit, as well as the tragic aftermath, but in this first blog I’ll be uncovering the location of the Chapter Coffee House where Anne and Charlotte lodged during their London adventure. On 7th July 1848 Charlotte Brontë received a letter that chilled her to the bone. It was from her publisher Smith, Elder & Co informing her that a publisher named Thomas Cautley Newby had been trying to sell the rights to The Tenant Of Wildfell Hall to an American publisher by stating that it was by the author of Jane Eyre, by then a smash hit. This confusion had resulted from the sisters’ use of pseudonyms, with Charlotte publishing as Currer Bell, and Anne and Emily as Acton and Ellis respectively. Nevertheless many critics and readers believed all their novels to be the work of one person. Newby, Anne’s unscrupulous publisher, had decided to exploit this belief to make a killing for himself, and Charlotte’s publishers were mortified that they may have been duped by the mysterious Currer Bell who had promised them rights to a new book. The Bronte sisters were horrified, after all their very honesty was now being called into question. A conference was held and an incredible decision made – the only way that they could prove their identity would be to go to London themselves. This would involve the dramatic step of throwing off their ‘Bell’ masks but that position of secrecy had now become untenable. 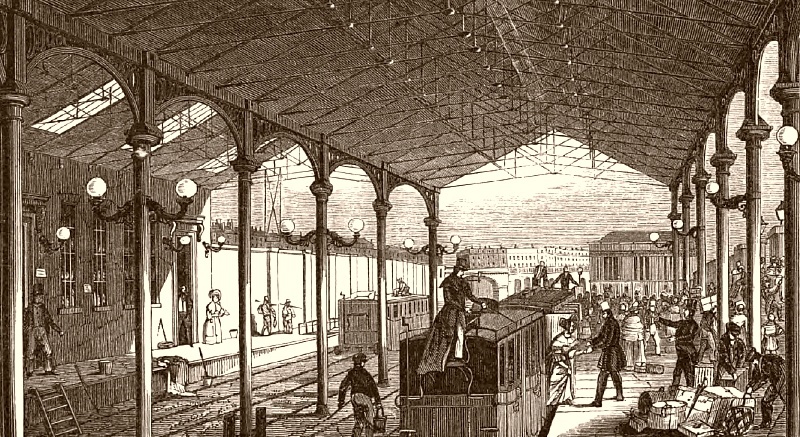 Emily gave them their blessing, but remained at Haworth, and within hours of receiving the letter at the Parsonage, Charlotte and Anne had already set out on their rail journey to London. They had acted, as always, hastily and decisively, and when they arrived in London in the early hours of the 8th of July they realised that they had no idea where to stay. After a little thought, Charlotte recalled the Chapter Coffee House on Paternoster Row. It was here that she, Emily and their father Patrick had stayed as they made their journey to Brussels in February 1842, and a location that Patrick had stayed at himself as a young man. Hailing a cab, Charlotte asked to be taken there; it was quite simply the only location in London that she knew. Once there, Anne found the location very much to her liking. It was exactly opposite St Paul’s Cathedral, and she could hear the bells ringing and look out at the magnificent building from her window. If the proprietors of the Coffee House could not have guessed the nature of the two young geniuses who were now staying with them, neither could Anne nor Charlotte have realised that they were the latest, if greatest, in a line of writers to frequent it. In the late eighteenth century it had become very fashionable among the capital’s literary set and had been visited by the likes of Samuel Johnson, Oliver Goldsmith, and Thomas Chatterton. Once settled into the Coffee House, and having taken some refreshment, the sisters wasted no time in heading off for Smith, Elder & Co of Cornhill. You can read the incredible story of what happened then in the next blog. One mystery, however remains: just what happened to the Chapter Coffee House? By careful examination of descriptions, maps old and modern, and study of the area as it is today, I believe the location can finally be revealed. We know, of course, that the House was on Paternoster Row to the rear of St Paul’s Cathedral, but the area has changed drastically since 1848. 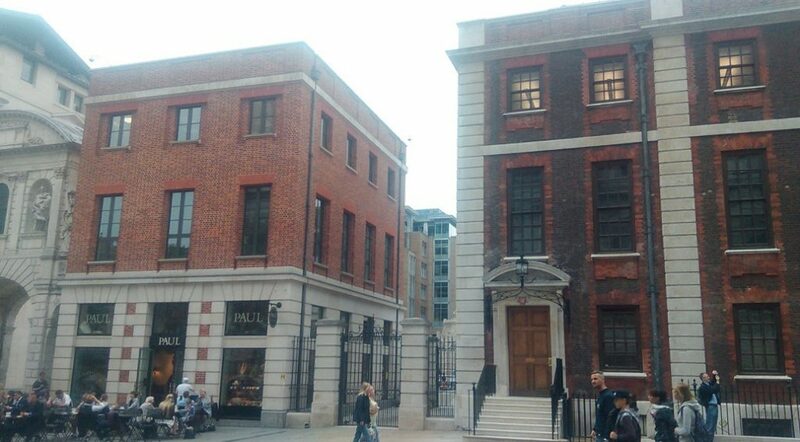 It has been supposed that the Coffee House was somewhere in the open area now known as Paternoster Square, yet it seems to me that the correct location is still on what is today’s Paternoster Row, directly in front of The Temple Bar. 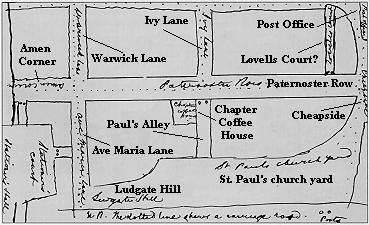 As a starting point, let’s take a map that Patrick Brontë has very usefully drawn showing the location of the Chapter Coffee House. Some streets are no longer there, but some remain and the positioning of Ludgate Hill, Ave Maria Lane, Amen Corner and Cheapside give us a big clue to where it actually was. We can see that the Coffee House was located on the corner of a street called Paul’s Alley which was no longer there, but below Amen Corner itself. This means that it couldn’t be in what is now the modern Paternoster Square. If we take a look at this modern map and compare it to Patrick’s, I’ve marked with a red C the spot where the Chapter Coffee House actually stood. Unfortunately on the exact spot where the Chapter Coffee House stood is now a gap. 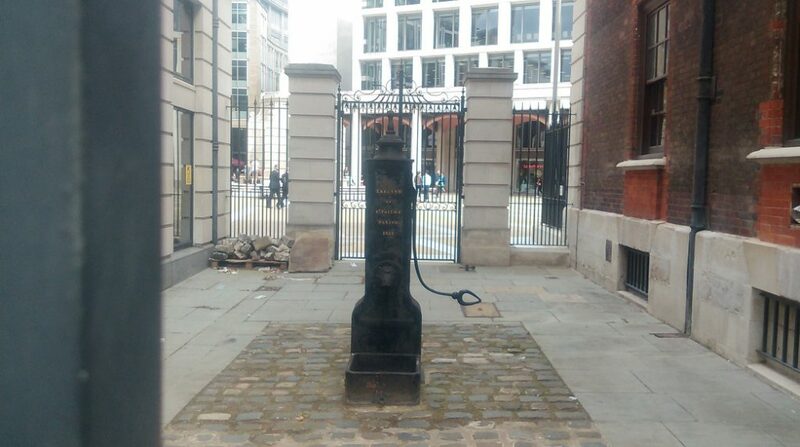 In the gap is a pump saying erected by St Faith’s Parish 1819, but this pump was only moved to its current spot in 1973 just as the imposing Temple Bar behind it was only moved to its current site in 2004. The roofline of Paul’s and Chapter House is different to that in the picture, but that is because the roofline had to be restructured. Examine the third story windows and you can see the outline of the taller windows that were originally placed there, just as in the illustration. The reason for this restoration is given in the architectural evidence provided by the company currently working on the restoration of Chapter House. 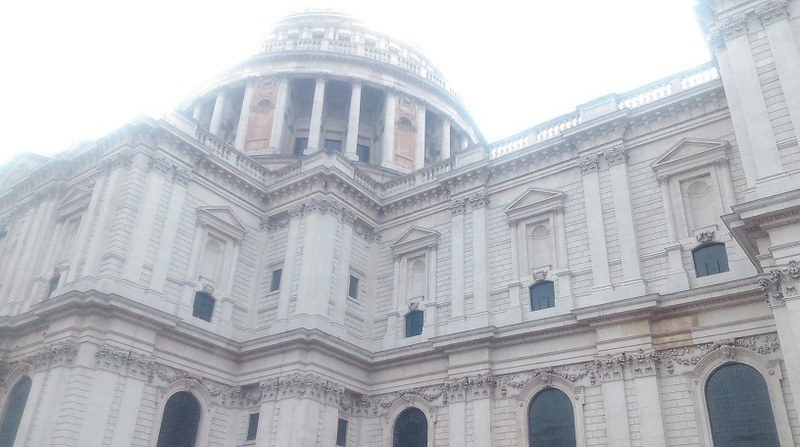 It’s well know that St Paul’s Cathedral itself survived the bombing of London, the Blitz, in World War Two, but the buildings opposite suffered a direct hit and were caught up in a conflagration. Much of the structure was gutted, yet the outside façade remained, and restoration saved what are now Paul’s and Chapter House. The building in the middle, where the gap now is, was obviously beyond saving and the Chapter Coffee House was lost forever. There is little doubt in my mind that the gap next to Chapter House once saw two nervous young Yorkshire women walk through a door no longer there. The bricks are now gone, but the ghosts remain, and by standing on the spot we can still enjoy the view of St Paul’s Cathedral that must have thrilled Anne so. I have always wondered where the location of Chapter Coffee House was exactly. You gave us the answer! Something to go and see on my next visit to London. You are doing beautiful work! This site is a boon to us London area Bronte Society members as we try to dream up walking tours and other events for our group. Thank you for all your research and advance leg work. I have one small quibble (sorry!) with your identification of the gap as the location of the Chapter Coffee House. On the basis of historical maps I’ve been looking at online and historical images of the Wren Chapter House, it seems to me that the gap has always been there and is, in fact, the vestige of St Paul’s Alley as figured on the Rev PB’s map. The coffee house (which must have derived it’s name from the Chapter House itself?) seems to have been located further back on what was the corner of St Paul’s Alley and Paternoster Row — probably beyond that gate (site of the old churchyard precinct gate?) in what is now the open Square. Thank you so much Krista! I see that I will have to look further into the precise location of the Chapter Coffee House – what a pity, I love standing on that spot and picturing what might have been! I would love to come on one of your tours and walks one day, keep up the great work! Belated follow-up. Don’t let me detract from your enjoyment of that gap. I think we can officially designate it a Brontë mana spot. They would definitely have walked through this passage to walk back and forth between the Chapter Coffee-house and the cathedral, and Wren’s Chapter House Cathedral would have been there for them to admire, as it is for us today. You have probably visited Geri Meftah’s ‘Brontë Sisters Blog’. She did a post on the Chapter Coffee-house as well (see http://kleurrijkbrontesisters.blogspot.co.uk/search?q=Chapter+Coffee+house). Her post includes an engraving (no source cited) which she reads as showing a lady walking through St Paul’s Alley in the direction of the cathedral, away from Paternoster Row (now, Square). This would mean that the street extending behind the lady, beyond Paternoster Row, is Ivy Lane, as indicated on the Rev PB’s map. He had an excellent spatial memory, it turns out: could the two dark dots he made at the end of St Paul’s Alley represent the bollards shown in the engraving? (or their functional antecedents)? 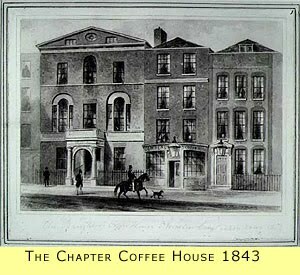 Anyway, the engraving shows signage for the Chapter Coffee-house arching over the alley. It seems there was a side entrance to the coffee house on the alley. I think that end of the Alley no longer exists. Where it ran is now part of the Square. But the portion that runs along the side of the Chapter House Cathedral was there. We can therefore say it unequivocally: to stand in the gap is to stand in the footsteps of the Brontës.